November 2016 - Perry Hood Properties, Inc. If you’ve been browsing our available homes section, you’ve likely noticed that our homes feature walk-in showers in the master bathroom. We’ve found that these walk-in, and often frameless showers are a hit with Tulsa area home buyers. 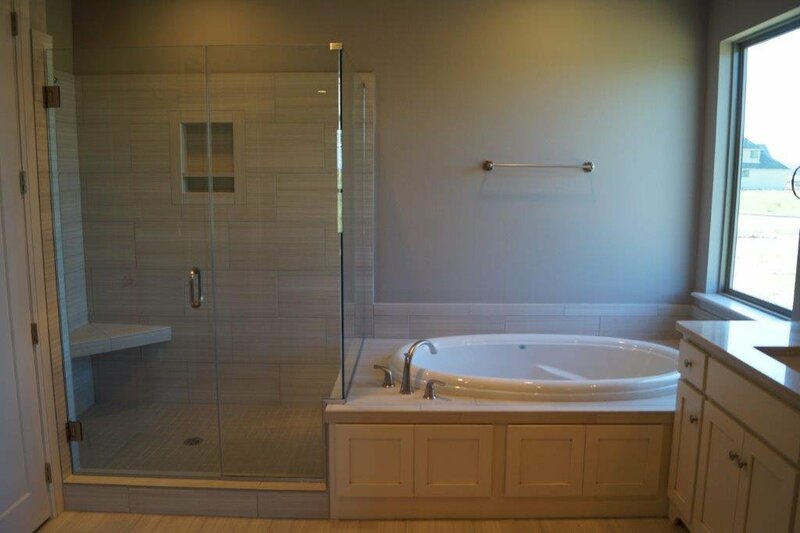 But, why should you prioritize finding a new home with a walk-in shower? Here are a few reasons. If you’ve lived in a home with a cramped or cluttered master bathroom, you know how frustrating that can be. In addition to fitting in more features and counter space, having a spacious master bath simply feels more relaxing and gives you room to move freely. Walk-in showers saves space by fitting into corners and they give the illusion of space thanks to their glass enclosures. A large portion of accidents in the home happen in the bathroom. The floors can be slick and often get wet, which makes a fall more likely. A walk-in shower reduces fall risks by simply living up to its name. Rather than having to step over a tub, or the lip on a traditional stall shower’s tray, you can walk in and out without the risk of tripping. The glass surrounding the shower is also helpful to allow more light in, and allow you to see the rest of the bathroom while you shower. Frameless showers have less hardware than a typical shower, which means there are fewer nooks and crannies to clean. Instead, you have easy to clean tempered glass panels, and a tiled floor that can be mopped along with the rest of your bathroom. The typical pieces that wear out first on a shower are the hinges and seals. Walk-in showers minimize the potential for wear and tear, which means they last longer and retain their original look. In addition to keeping your home as beautiful as the day you bought it, walk-in showers also boost the value of your home. So, if you ever decide to sell your home, your master bathroom with the sleek walk-in shower will help bring in more buyers. If you’re looking for a home with modern features like walk-in showers, granite counters, and patio fireplaces in Tulsa, Broken Arrow, or Bixby, browse through our available homes and call us today.